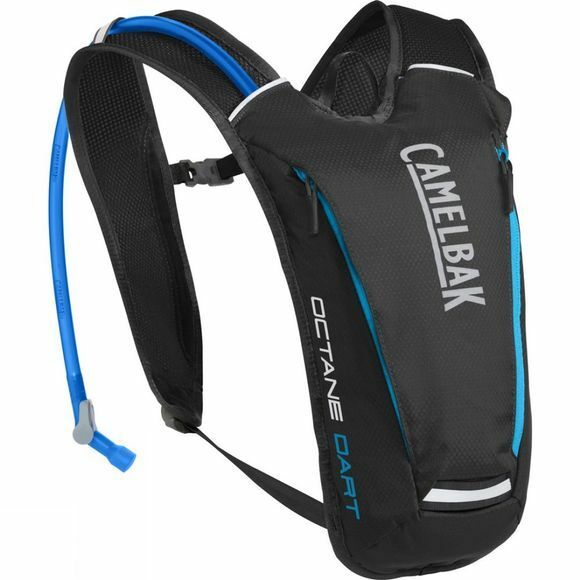 The Octane Dart Hydration Pack from CamelBak features a minimalist design and ultra lightweight yet durable fabrics. It is a great option for easy hydration while on the move with a 1.5L capacity for water and a convenient 0.5L for storing other essentials. The Crux bladder features a standard exit port that has an on/off lever making it easier to prevent leaks and a tube trap on the front of the harness holds your bite valve in place between sips. Simple, intuitive and able to hold everything you need on the go. CamelBak emerged out of the simple desire to find a hands-free solution to hydrating on the go. Originally made from an IV bag and a sports sock, the first CamelBak was developed by cycling enthusiast Michael Eidson during a gruelling 100 mile race through the Texan summer. From that moment of innovation, CamelBak was born, and since then has grown into a range of water bottles, hydration packs, reservoirs and accessories; helping you to stay effectively hydrated and safe when working hard.